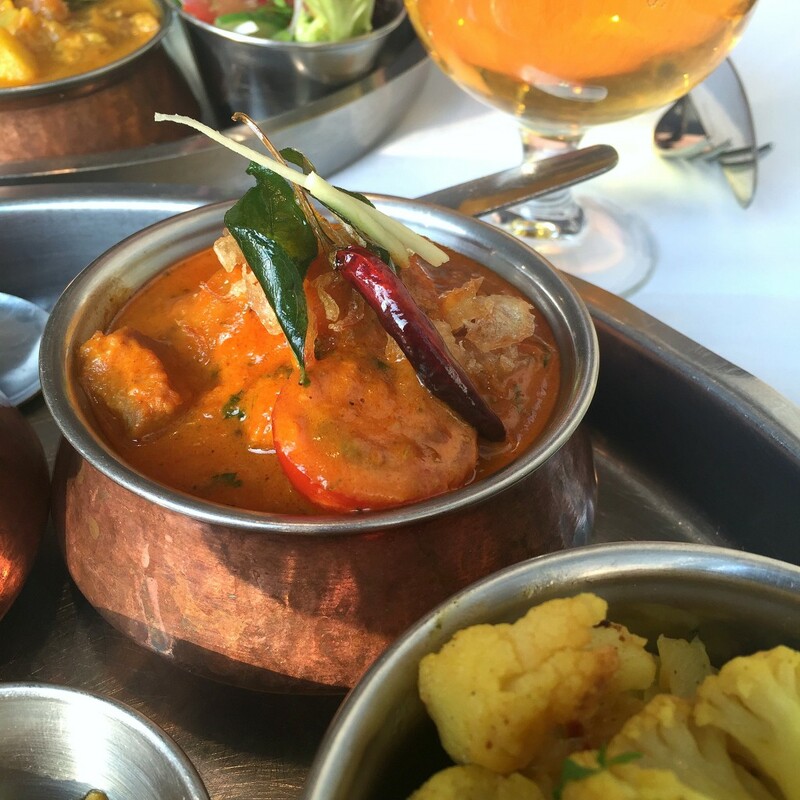 Simply Indian is a cosy restaurant just moments away from Borough station. This intimate spot offers a range of authentic dishes from North and much of South India. Although the restaurant may look rather plain, the food is definitely anything but. Simply Indian has won the TripAdvisor Certificate of Excellence Award every year since 2013. And I can see why – the food is simple, honest and delicious. I was lucky enough to bring along my husband for this review which he was very happy about! 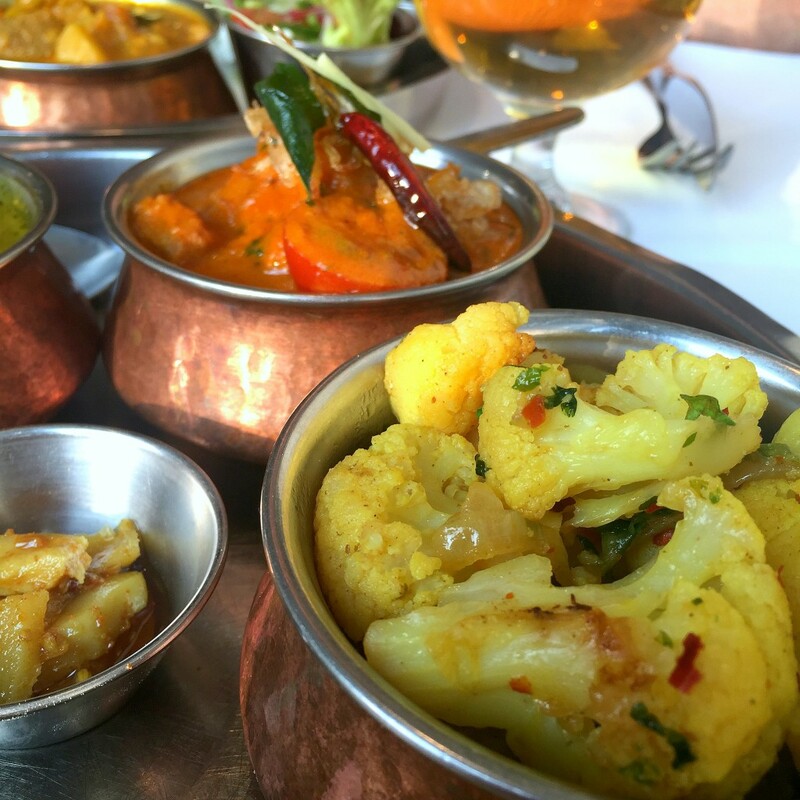 A couple of weeks ago on a very sunny Friday evening we made our way to Simply Indian. This is a BYOB restaurant which means you can bring along your favourite tipple and they even have an understanding with the nearby pubs meaning you can bring along your pints if you wish! When we arrived we asked our lovely waiter straight away what was good to have. I love Indian food but have to admit that I’m never really adventurous when at an Indian restaurant. I seem to always stick to a variation of lamb saag, chicken bhuna or chicken jalfrezi and aloo gobi. It’s very rare I order much outside of this. 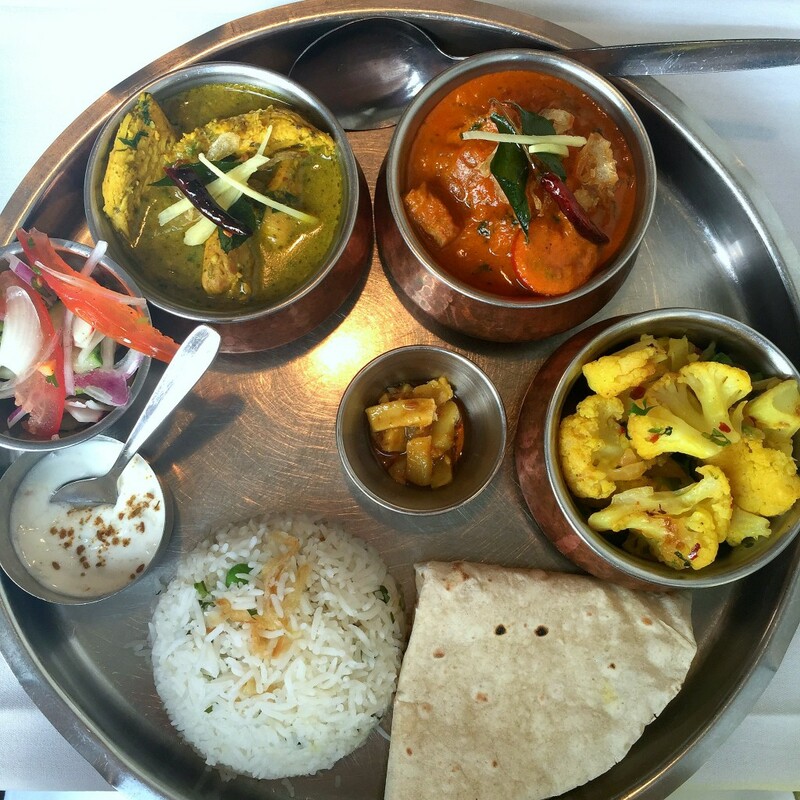 Because we wanted to try some new flavours it was suggested we try the Grand Thali. 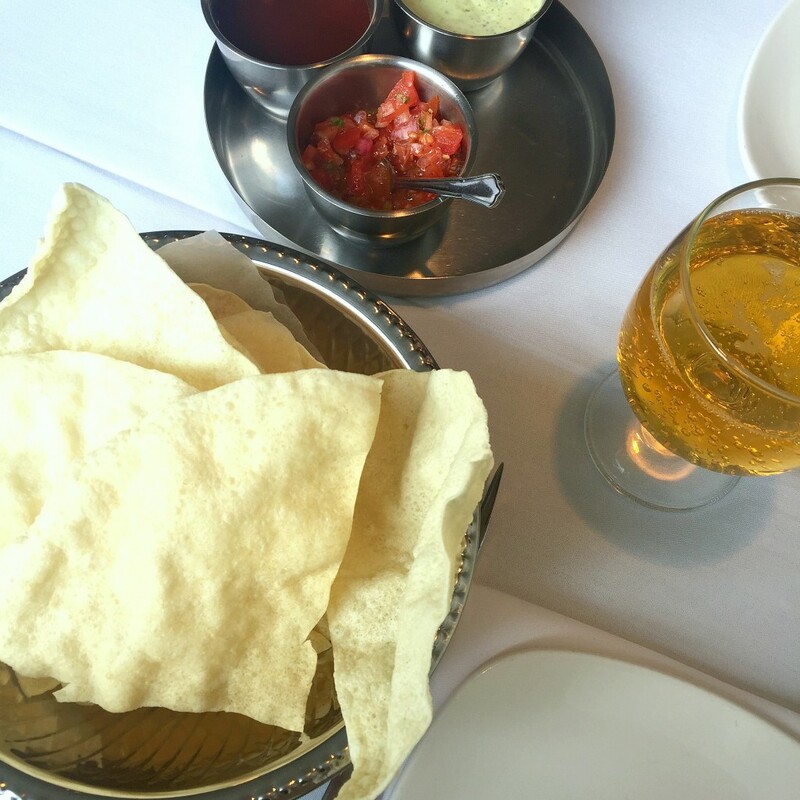 But first, no indian meal can begin without light, crisp poppadoms! Served with a trio of tasty dips we devoured these quickly. There was the classic mint sauce and a salsa chutney, but new to me was the tamarind chutney. It was sweet, sour and zesty – I really liked it. 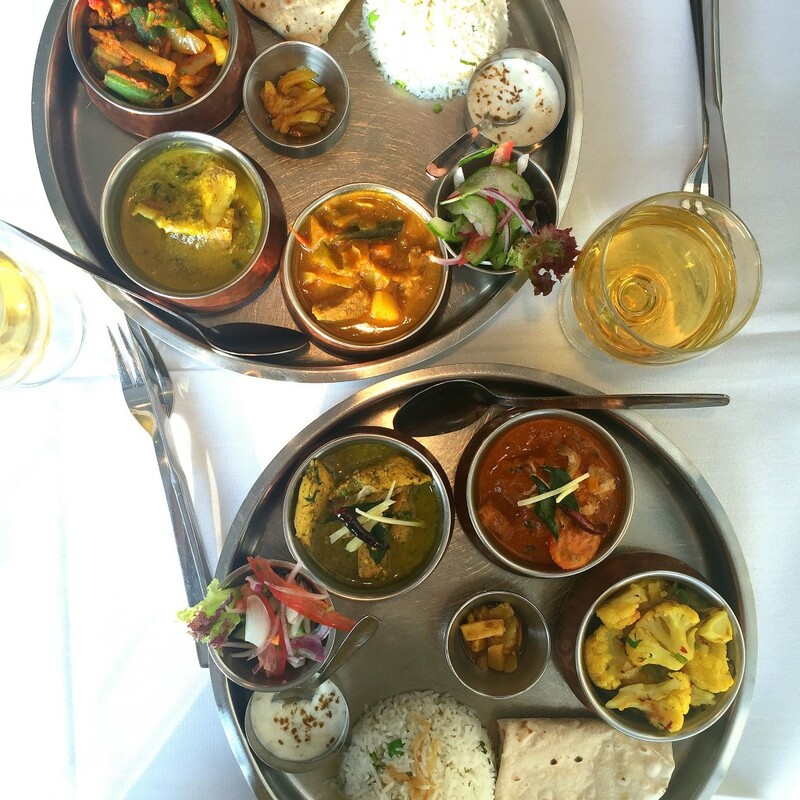 At Simply Indian the Grand Thali consists of lots of small dishes served on a large metal tray. There are two curries, a couple of sides and rice. We each got two different curries so that we could try 4 in total – now this is my kind of Indian meal! I love to try a little bit of everything, mixing all the flavours. I never like to go to an Indian restaurant and just order one dish for me, I love to share the dishes among the table. Way more fun that way. The three main dishes on D’s tray consisted of Goan Chi Curry, Fish Tikka Hara and Okra Dopiaza. Mine was made up of Mamsa Ishtua, Lamb Rogan and Cauliflower Bhaja. Both trays also came with Indian Salad, Rice, Chapati Bread, Raita, Garlin Pickle and a mini Rice Pudding. As you know I’m a sharer so we both had a bit of all the curries on offer and built up a pretty epic plate of food. I’m going to start by saying I am no connoisseur of Indian food, but, I really enjoyed this meal. The Fish Tikka Hara and Goan Chi Curry were both towards a medium heat with the Chi being lovely and fragrant. I would never normally order the fish curry, but the white fish which has been slow cooked really took on all the spices. I love lamb curries and the Lamb Rogan did not disappoint. This slow cooked lamb curry is bathed in rich red chilli, onion and tomato with saffron. I had never seen Mamsa Ishtua before so I was more than happy to try something new. This coconut milk based curry was warming and deep in flavour with such tender lamb. I will definitely be ordering this again if I see it on the menu. We were also brought a portion of chilli cheese naan. I liked this version of naan but it didn’t really go with the rest of the meal in my opinion, it felt like a weird add on compared to the other authentic Indian food. Now when the trays came out I thought it would be easy to fit in dessert. Oh how wrong I was! It was deceivingly large. Even D couldn’t manage anything else which means it must have been super filling. However with each Grand Thali we were brought a little pot of what I can best describe and a sweet and slightly spiced rice pudding. It was the perfect size post Thaili. 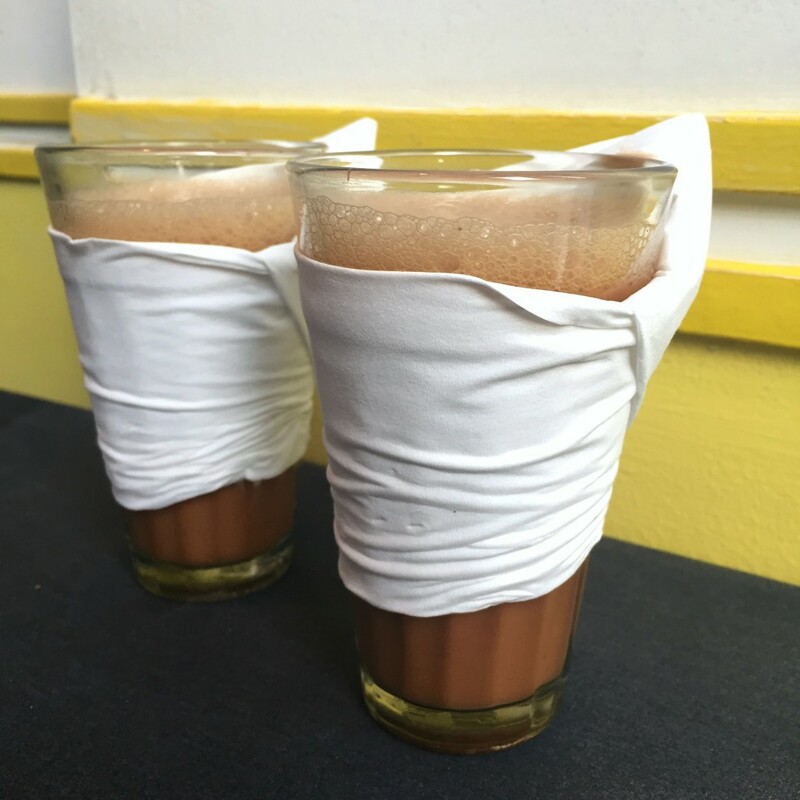 We finished with a Bombay Chai, which is a twist on the classic. This was beyond delicious. I wish wish wish I could make this at home. It consisted of cinnamon, ginger, cloves, nutmeg and full-leaf assam tea. It was sweet but because of the aromatic spice it was so moorish and warming. Seriously good! Would I return to Simply Indian? Yes I would. No, this is no fancy pants Indian restaurant but the food is very good and it’s great value too. There were lots of different items on the menu here which I liked. I’d go back for that Bombay Chai alone! *I was a guest of Simply Indian, but as always my views are my own and I’ll let you know when i recreate that Bombay Chai!